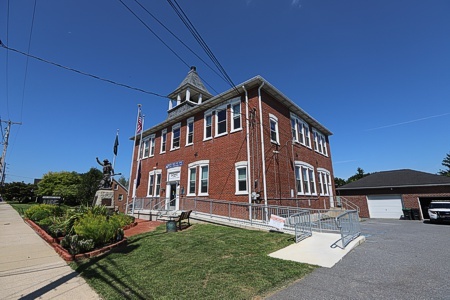 Tatamy received a grant in 2017 to replace the ADA ramp and steps into the Municipal Building, located at 423 Broad Street, which have served us well for many years but can no longer just be repaired. Weiss Construction was awarded the project at the March 4, 2019 Council Meeting. They will be replacing the ramp, steps, and installing a sidewalk on the west side of the building to be used as temporary access. The new ramp and steps will meet all current standards for ADA compliance. During construction, access to the building- the Post Office, Police Department, and the Borough Office, will be limited. 	April 22- work begins on sidewalk to Office emergency exit stairs on the west side of the Building. Work to be completed by April 28th. 	April 29- Main entrance closed. Work begins on the ramp and steps. Only access to the Post Office, Police Department, and Borough Office will be through the Office emergency exit on the west side of the Building Monday through Friday 9 am to 5 pm. 	June 11- Main entrance opens. 	This schedule is weather dependent. Updates will be posted if necessary. For those unable to use the emergency exit stairs to enter the building, please contact Deanne or Nancy in the Borough Office to make arrangements- 610-252-7123. We will be more than willing to help you. This is a temporary inconvenience for a permanent improvement! If you have any questions regarding this matter, please feel free to call me at 610-252-7123. Borough wide street sweeping will be April 18 & 19. This is weather dependent. For more information click HERE. The removal and replacement of Bushkill Street bridge began April 15, 2019. Detours are posted. Only local traffic on Bushkill Street. The project is anticipated to be completed by mid June. House numbers are not only convenient for finding addresses but necessary for emergency responders to locate those in need. When responding to an emergency, minutes matter so be sure that fire, ambulance, and police personnel can easily and quickly find your address. Address Numbers. Buildings shall have approved address numbers, building numbers, or approved building identification placed in a position to be plainly legible and visible from the street or road fronting the property. These numbers shall contrast with their background. Address number shall be Arabic numerals or alphabet letters. Numbers shall be a minimum of 4 inches (102 mm) high with a minimum stroke width of 0.5 inch (12.7 mm). Where access is by means of a private road and the building address cannot be viewed from the public way, a monument, pole, or other sign or means shall be used to identify the structure. �	Script numbers or numbers that are spelled out in words may be aesthetically pleasing but are difficult to read quickly from the street. �	Brass or bronze numbers are difficult to see. Use numbers that contrast with the background. �	If the house is located more than 45 feet from the street, the numbers should be displayed on a fence, mailbox, or other appropriate place that will make it visible for approaching vehicles. �	Be sure that the view of the numbers is not obstructed by shrubs, trees, or decorations, such as flags. �	Numbers should be clearly seen when approaching from either side of the house. If the numbers on your house are not visible or easy to read, it will take emergency personnel longer to reach you. Those extra minutes spent trying to locate a property can mean the difference between life and death, so take the time now to be sure your house numbers are able to be seen from the street to help emergency responders find you faster. Wolf Administration Announces State Investment to Implement the Bushkill Creek Restoration Project in Northampton County Harrisburg, PA - The Wolf Administration today announced grant funding to implement the Bushkill Creek Restoration and Habitat Enhancement Project in Tatamy, Northampton County. The Pennsylvania Department of Environmental Protection (DEP) awarded a grant of $80,000 to the Bushkill Stream Conservancy. The watershed group will use the funds to install structures in Bushkill Creek to create a better habitat for aquatic life. The money will also be used to install riparian buffers that will stabilize 1.5 miles of stream bank through the Borough of Tatamy. Once those buffers are installed, more than 6,500 feet of the stream will be restored allowing for better water flow. Bushkill Creek, although designated as a “high-quality” cold water stream, is classified as “impaired” in this section of the borough for pathogens, which allows for special protections. The improved habitat from the project will help protect aquatic life from possible exposure to pathogens. One of the largest investments into Pennsylvania’s environment, Growing Greener projects have been instrumental in cleaning up abandoned mine lands, preserving farmland, and protecting and restoring watersheds throughout the commonwealth. The Growing Greener grant program is supported by the Environmental Stewardship Fund, which receives its funding from landfill tipping fees. Tatamy Borough is pleased to announce our participation in the Nazareth Area Council of Governments Animal Control Program. Beginning January 1, 2019, Pibbles Paws Safe Haven will serve as our Animal Control Officer. The animal control program will only cover dogs at this time. Pibbles Paws Safe Haven is located in Moore Township and is a state-licensed facility that currently works to rescue adult dogs and puppies in need of a forever family. The Facebook page for the animal control officer is Pibbles Paws Safe Haven ACO Stray Intakes. Pictures of lost or stray dogs will be posted on this page as well as other important information. If you see a lost or stray dog, please contact the Northampton County Non-Emergency Dispatch Number at (610) 759-2200. They will coordinate the dispatch of local support and the Animal Control Officer as needed. Please do NOT call 911. Thank you. Looking for a way to be more involved? Interested in steering the future of Tatamy? Become a member of the Zoning Hearing Board. Call the Tatamy Borough Office for more information or attend the next meeting January 24, 2019 at 7:30pm. To download the 2019 Budget click HERE. The Budget is available for review in the Borough Office. Nazareth Area School District calendar for the 2018 - 2019 school year. To download the calendar click HERE. This is a list of locations to recycle many of the items that can not be disposed of with regular household garbage and recyclables. The Tatamy Police will be offering Safe dispose of your unused, unwanted, or expired medications. Any on duty Police Officer can accept the medications. please see the list of accepted and unacceptable items below. Call the Police Department at 610-252-2260 for more information. In 1982 the Tatamy Historical Society was formed by William Carling, Joanne Wagner and Nancy Werkheiser. The Archives opened in June of 1993 to commemorate Tatamy's Centennial. Much of Tatamy's history is preserved in the form of pictures, newspapers, scrapbooks, clothing, furnishings and other memorabilia. A one of a kind Tatamy Centennial Quilt is among the many displays. Other areas of interest include the following exhibits - Military, Tatamy Athletic Association, Tatamy Fire Company and Tatamy School, just to name a few. All are invited to come explore the history of Tatamy. Admission is free. Contributions are always welcome. Tatamy Borough has ordinances pertaining to grass and weeds. 19- 1958 and 53-1968- known as the Grass and Weed Ordinances requires all citizens and businesses to keep grass cut below 6 inches. Cut grass is not to be put in the street. Please, do not blow clippings into the streets. This clogs the gutters. Thank you! Removal of clippings is the property owner's responsibility. Moving permits are required for those moving into and out of Tatamy. The cost is $5.00 and can be obtained at the Borough office. This permit is valuable to you especially for tax purposes and to the Borough. Junk Vehicle Ordinances 188-2000 (which repealed 45-1967)and 244-2007 (amending sections 5 and 13 of 188-2000) prohibiting the storage of motor vehicles upon any street or alley or on private property for more than 7 days that does not display current license plate and/or current registration sticker and current emissions sticker (where required by law); is not in operating condition; or is a junk vehicle. Sidewalk ordinance 20-1924. Sidewalks and gutters must be cleared within 24 hours. In the event of ice, sand or salt should be applied. Please DO NOT place snow / ice in roads, on sidewalks or next to fire hydrants. Any help in keeping the fire hydrants cleared and accessible is greatly appreciated! 7th, Broad, Chief Tatamy, High, Main, Prospect, Shelley, and Trisha Streets, Alexus, Bridgette, Fern, and Mill Brook Courts and Mill Race Dr. Please move your vehicles from these streets when a Snow Emergency is called. All vehicles will be towed at owners expense if they are not moved. Tatamy Borough is located in Northampton County and is approximately 1/2 mile square. It is surrounded by Palmer Township to the south, Nazareth Borough to the west, Stockertown to the north, and Forks Township to the east. The 2010 census put Tatamy's population at 1203. There are just under 450 residences in the Borough. Tatamy is home to 14 businesses, 2 churches and a Masonic lodge. Borough children attend the Nazareth Area School District. given his land from the Penn family for his services to them as a messenger & interpreter. In 1745 Tatamy was the first Native American baptized by David Brainerd. The background & history of Tatamy is interwoven with the generations of the Messinger family that owned, occupied, & helped the area develop into a community. In 1771 Michael Messinger Sr. Bought 500 acres of land that includes present day Tatamy. In spring of 1893, having become a fair-sized village, citizens of the town met to discuss separation from Palmer Township & incorporate into an independent borough. They were Samuel S Lerch, Ellen C Messinger, JA Happel, Martin Werkheiser, Amzie F Titus, Samuel A Messinger, Edwin Babp, Jacob Hagley, G Frank Messinger, JM Stecker, CS Messinger, & Milton Johnson. The petition was addressed to the court on April 10, 1893. April 13, 1893 the Grand Jury recommended the petition be granted. Judge HJ Reeder granted the Decree of Incorporations on June 12, 1893. Tatamy is a small community that values its past, strives to create a worthwhile future, making the present a place people want to be part of. We hope that you find everything you are looking for. Please do not hesitate to contact us if we can be of assistance to you.